One of the big complaints about Kennedy and The Last Jedi is that they have been forcing politics into Star Wars, an assertion which is, in my opinion, frankly absurd. I mean, how is The Last Jedi any more political than any other Star Wars film? Decrying rich people, keeping the spark of revolution alive... these are certainly political statements, but they're hardly pointed at any specific modern context, nor is are they more pronounced than what has come before in Star Wars. I mean, if Revenge of the Sith had come out in 2018, these alt-right types would have had an aneurysm. 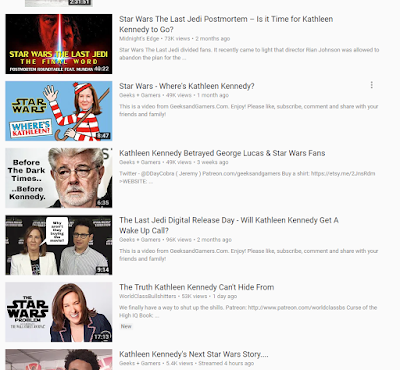 Similarly, probably the most common complaint against Kathleen Kennedy is that she forces "politics" into Star Wars, and by that the complainants mean that she pushes for diversity in gender, race and sexuality in the franchise. That's right, people are getting all riled up about "social justice warriors" again and it is, quite frankly, sickening. We're well past the point where being staunchly anti-political correctness is an acceptable stance, ever since that mindset gave birth to the alt-right. Hell, it has gotten to a point where anti-PC types are arguably even more annoying than the actual SJW types that they rail against, having falling into this mirror image of the very thing that they oppose so vehemently. So yes, I believe that we're seeing a micro version of the larger social zeitgeist playing out within the Star Wars fandom, with diversity being opposed by those who are calling for a return to the "purity" of what Star Wars should be. That's not to say that there aren't legitimate complaints about the direction of Star Wars outside of a racist/sexist/homophobic angle - there clearly are, but I feel like the more unsavory side of the fandom is co-opting that discontent to draw people to their viewpoint. You mean creating characters, such as Daisy Ridley’s Rey, meant to empower women is a bad thing? 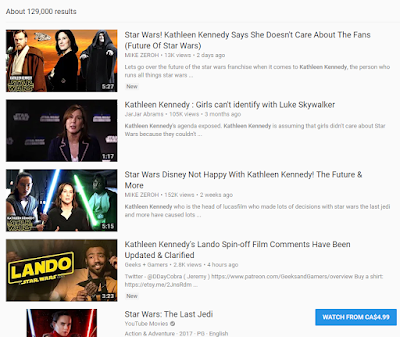 Women holding an equal place within the Star Wars universe is bad? I don’t know where you get your delusions, laser brain. Gabriel even claims that he’s not sexist. Um, yes you are. News flash: if you use the term 'feminazi' you’re a sexist." Now I'm waiting to see what happens when the alt-right gets wind that Lando Calrissian is pansexual. I don't think George Lucas intentionally made Star Wars a predominantly-white franchise intentionally, it was just the reality of the business at the time and he didn't think to change that up. Kennedy is clearly more aware of this and has the ability to push forth for more equality and so I'd say that it's good that she tries to. 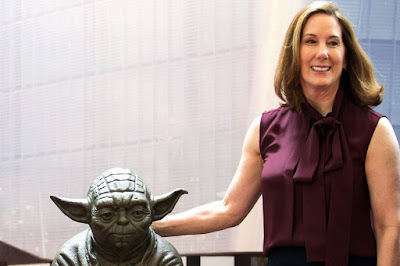 Now, she could certainly go too far one way or another, but for now at least the diversity doesn't feel like tokenism, nor are we looking at a "white genocide" by any means (I mean, just look at Solo, which seems poised to become its own white-male-led franchise here under Kathleen Kennedy's rule). For my own part in all this, I feel like Disney can't mine the legacy of Star Wars forever. When I first heard that Disney was purchasing the franchise, I was hoping that they would be moving beyond the original trilogy and going forwards or backwards in time. Star Wars is a phenomenon and anchoring yourself to existing success only limits the creative expression you can have sooner or later. At some point, they have to push forward and make it their own thing if they want the series to last (and according to their claims, they plan on making them for the next hundred years at least), a reality which is going to alienate some long-time fans. I feel like The Last Jedi did this successfully, especially after the far-too-safe The Force Awakens. I read an article recently where a Star Wars fan basically agreed, saying that the film would have been fine if only Luke didn't die at the end: "The most pathetic aspect of all of this is that Luke died because Kathleen Kennedy, JJ Abrams, and Rian Johnson wanted to make way for the new characters. They didn’t want them to be overshadowed. This isn’t what Mark Hamill signed up for. It’s ridiculous. Rey is a fantastic character, but Luke Skywalker defines Star Wars. It won’t be the same without him." But that's my point - a time would be coming regardless when Star Wars would be without Luke Skywalker. In a decade's time, the Skywalker saga might even just be a starting point in the Star Wars franchise. Really, the sooner we cut that tie to the past, the easier it will be to expand Star Wars on to future generations, including those who may not have had heroes to identify with before, and to keep the saga from being stifled. As my home-boy Kylo Ren said, it's time to let the past die. *Because apparently angry Star Wars fans put their faith in the tomatometer all of a sudden, and despite obviously not understanding that the tomatometer is an aggregate of how many critics gave it a 6/10 or higher, not an actual score for the film... wait, is the writer of that article equating a 71% tomatometer with a 7/10 for a video game? 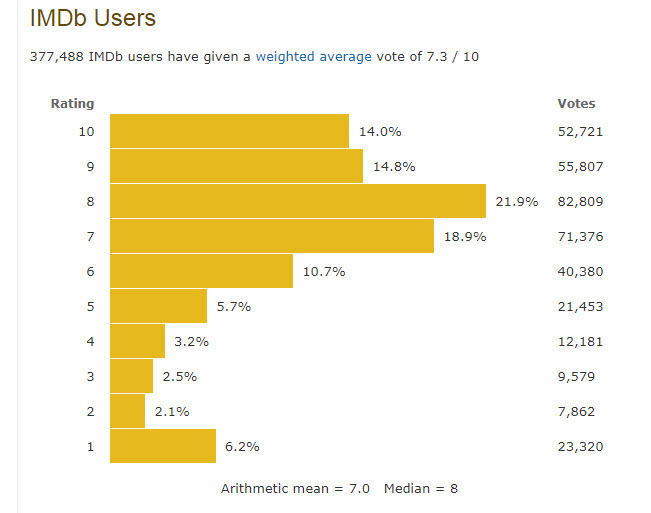 Because film critics aren't as awful as video game reviewers and a 7/10 is actually a good score... bloody hell. 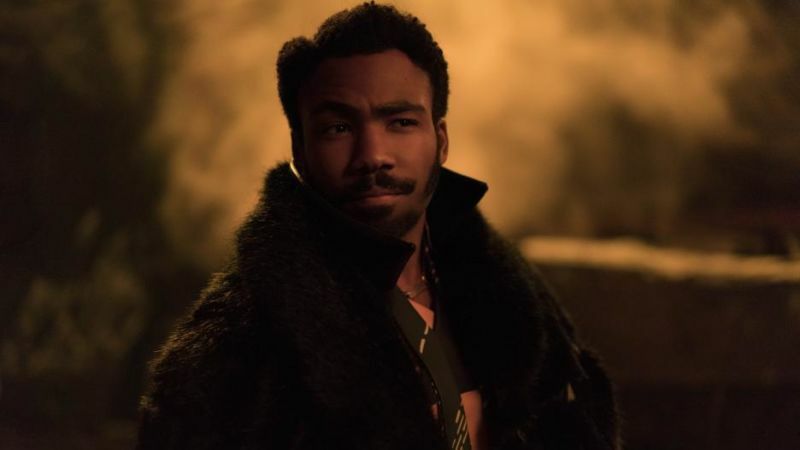 **POST-SCRIPT: I feel like Solo is failing in part due to people who were burned by The Last Jedi not showing up, but probably more in the general disinterest in a Han Solo movie, the negative buzz that has been dogging this film, and probably most importantly, the diluting of the Star Wars brand and "event movie" status.